Chhattisgarh NEET Counselling 2018: The Counselling will be scheduled in the 2nd week of July 2018. The counseling will be organized on the basis of NEET UG entrance exam. Through the counseling, the admission will be offered in the MBBS/ BDS bachelor degree state private and dental colleges/ government colleges. There is no state level examination is conducted to offer the admission. The scheduled of the Chhattisgarh NEET Counselling is given below the table. Chhattisgarh NEET counseling will be scheduled in the form of online choice filling and the locking the session i.e. the counseling will be conducted in the online mode. In the last round of the counseling, a candidate requires to physically present at the allotted center. The CG NEET Counselling 2018 Important Dates is given below the table. Applicants who apply for the Chhattisgarh NEET Counselling is required to get ready, as the institutes declare the dates of the counseling. The counseling is conducted on the various rounds, so here we are providing the CG NEET Counselling Procedure 2018. The procedure provided here is same follow at the time of counseling. 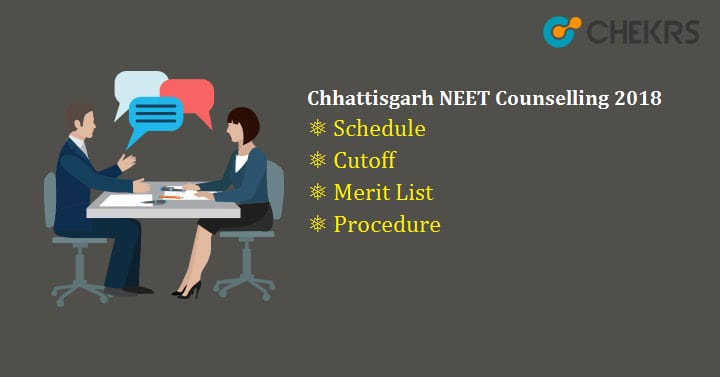 The Chhattisgarh NEET Counselling 2018 procedure is provided below. Applicants have to register on the official site. After it they have to create the user ID and password for their registration in the counseling. The fee for the counseling will be paid in the registration process. After the registration has been done, applicants are required to verify their document. It is necessary to carry an original set of the document along with the photocopy at the time of counselling. Candidate makes sure that they will not allow for sitting in the counseling if they did not bring any of the documents on the day of counselling. After the document verification has been done, the applicants are required to fill the choice of the college as per their requirement for getting the admission in the colleges. Candidates make sure that they will not allot the seat without the choice filling. On the day of counseling applicants are required to take the print out of their choice filling form. So that they get the seat in the colleges. After the filling of the choices, the seat is allotted to the candidate. Applicants who want to see their result of the seat allotment can see after a few days of choice filling in the official site. The seat will be allotted to the candidate according to their rank, choice filling by the candidate and the availability of seats in the colleges. At last applicants have to report on their allotted college with the provisional admission letter. When the Chhattisgarh NEET Counselling is organized, applicants are required to bring the original document along with the photocopies. The documents are used for the verification purpose. After the verification of the document, the candidates are required to report the college for confirming the seat. The list of Chhattisgarh NEET Counselling 2018 Document below. There is 15% All India Quota Admission while the 85% is for the state wise admission. Therefore applicant requires to know the Chhattisgarh NEET Cut Off marks. The cut off is released according to their category wise so here we are providing the details of the Chhattisgarh NEET 2018 Cut Off. Chhattisgarh MBBS merit list 2018 will give the information about the state merit list rank. The applicant whose name comes in the Chhattisgarh merit list will become eligible to attend the counseling session. Applicant able to check the Chhattisgarh NEET Merit List 2018 on the official website by entering their application number along with the password. After filling all the information candidate will be directed to the Chhattisgarh MBBS merit list. After all these, the seat will be allotted to the candidate according to their rank, choice filling by the candidate and the Seat availability. After the seat allotment, Candidates have to report to their allotted college with the provisional admission letter.